We typically scoff when the weather forecasters tell us that rain is on the way. Well, today it finally happened. Not that the heavens opened up, but my windshield did get a bit dirty. So Martine and I decided to visit the Hammer Museum in Westwood, which is located only a few hundred paces from where I work. I knew from passing it many times that the focus was on modern art, but there are two galleries with European art from the 19th century and earlier. The painting which most caught my eye was by the Belgian painter Alfred Émile Léopold Stevens (1823-1906). 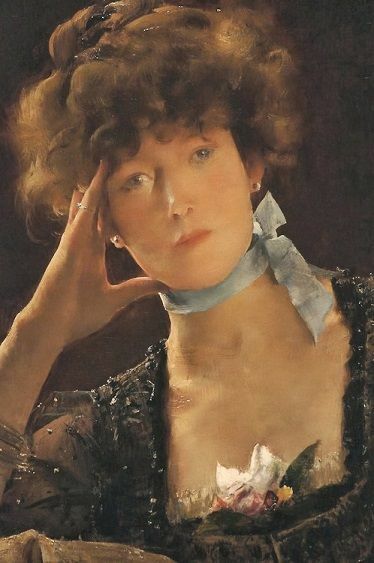 It was an 1885 portrait of actress Sarah Bernhardt (1844-1923). I was particularly impressed with the theatrical-style lighting from the left, including a striking glint around the model’s right eye. At the height of her career, Bernhardt looks like a commanding figure, even with the frilly ribbon around her neck. Her lips are pursed as if determined to get her way, yet she is delightfully feminine at the same time. 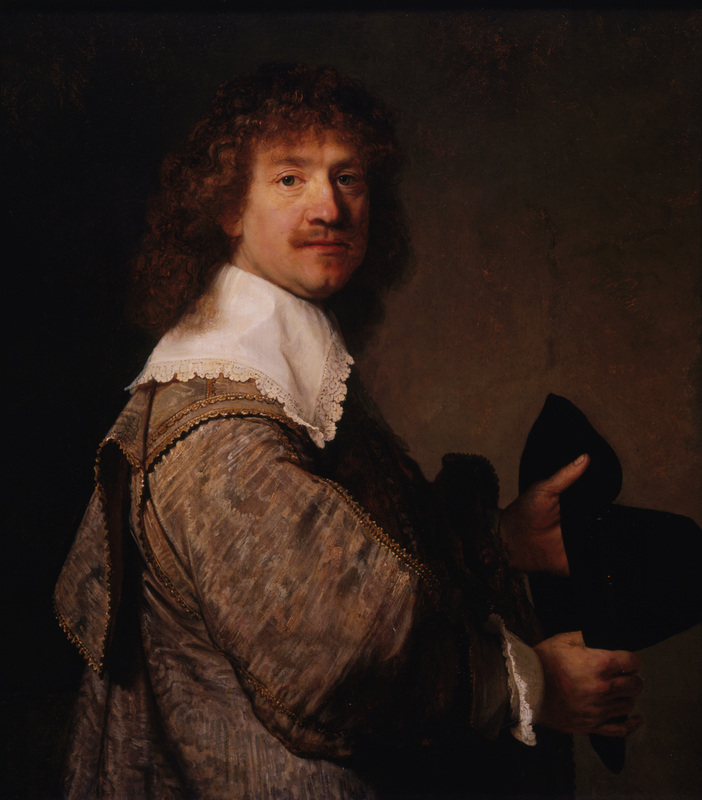 Also impressive was a Titian entitled “Portrait of a Man in Armor” and Rembrandt’s “Portrait of a Man Wearing a Black Hat” (both below). 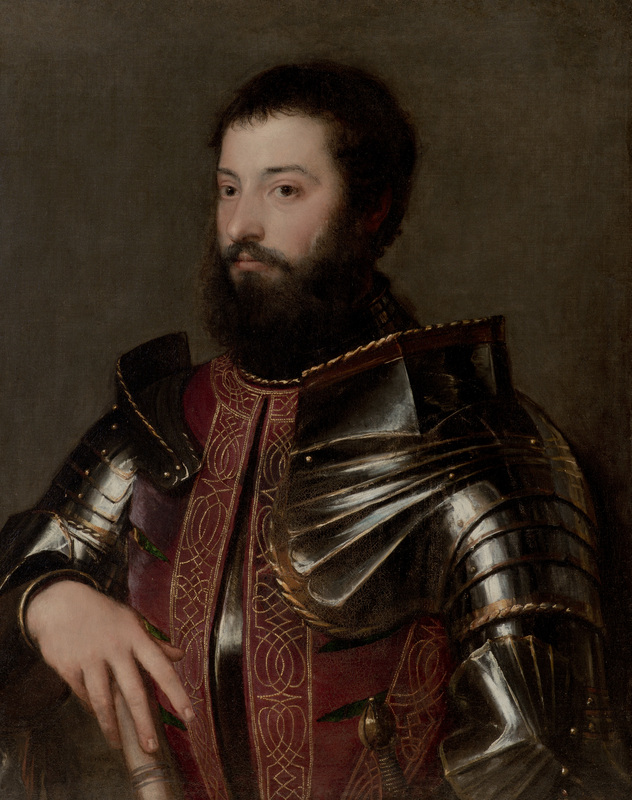 It’s not that the museum’s holdings were all portraits: It’s just that it was the portraits that most held my attention. What did not hold my attention was the museum’s substantial holdings of contemporary art. Call me a Philistine if you will, or even a Visigoth, but I prefer art that holds my attention. Stevens’s portrait of Bernhardt had me coming back several times. I did not even feel like entering the contemporary galleries after even the most cursory glances of their contents. The whole world of the smiling girl in he above photo is long gone, but her smile still speaks to us. 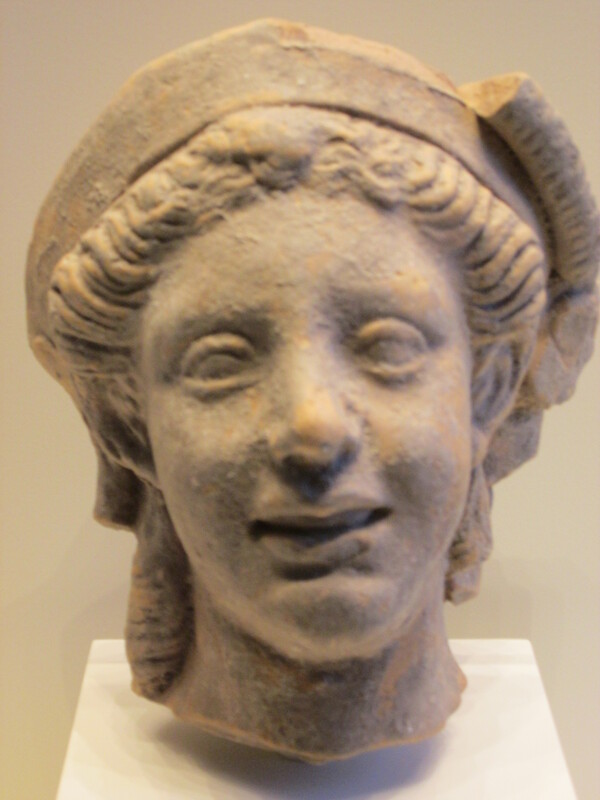 It tells us that, even in Ancient Rome, there was something to laugh about. When I took the picture on Friday, I did not note the provenance of the figurine, but I wonder if it was Etruscan. This ancient people is the only one that has allowed itself to be depicted as wreathed in smiles—very contrary to the picture we have of the dour Romans. Hi, We’re Dead. Why Don’t You Come and Join Us? 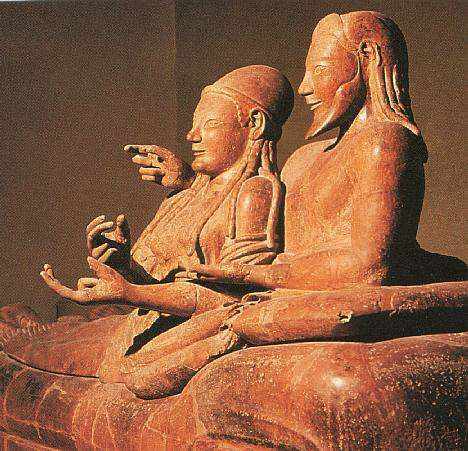 I guess my little figurine is not Etruscan.Their images always show them as having sharp features and almond eyes. The girl above is definitely Roman. That line about “all smiles stopped together” is grimly humorous. It is becoming a Black Friday tradition for Martine and I to go to—no, not a shopping center!—but the Getty Villa Museum in Pacific Palisades to view their Greek and Roman antiquities. But two and twenty summers was my whole life’s span. But my soul’s gone heav’nwards, to Oblivion’s land. This thought brings comfort to the shades of those who’ve died. 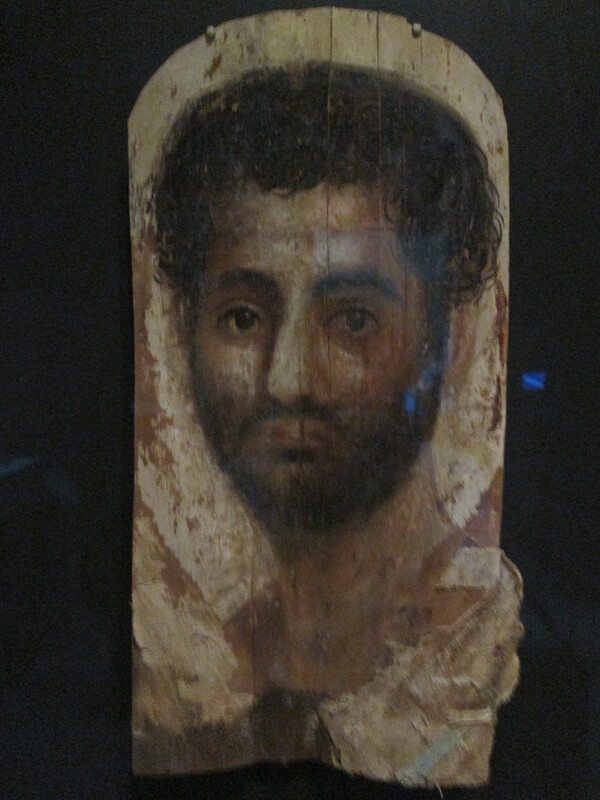 At the time these paintings were made, there was very little wall painting being done; whereas the art of mummy portraits was a highly regarded profession. 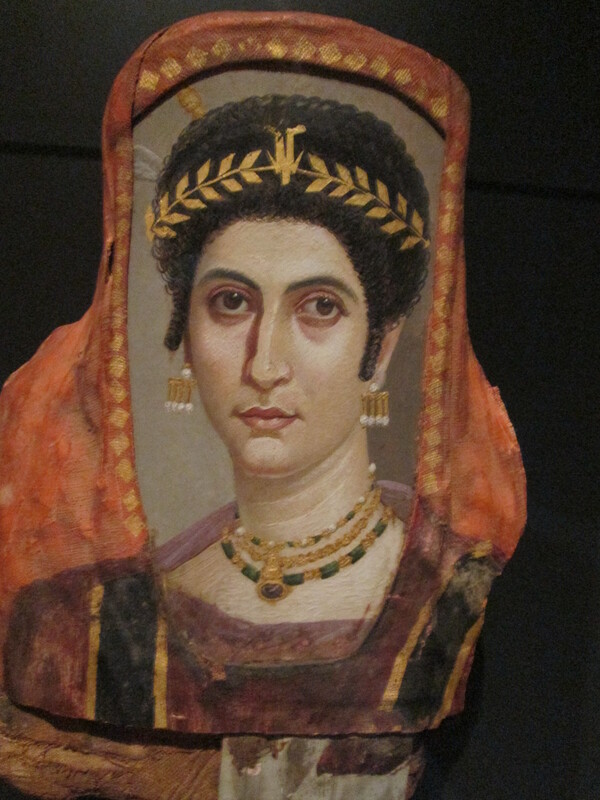 Many of these mummy face paintings have survived with rich coloration intact. Since the Greeks constituted the upper classes of the communities in which they lived, they could usually well afford to commemorate their dead in this way. The only question I have is: Why did they not produce face paintings for the dead who passed away at an elderly age? 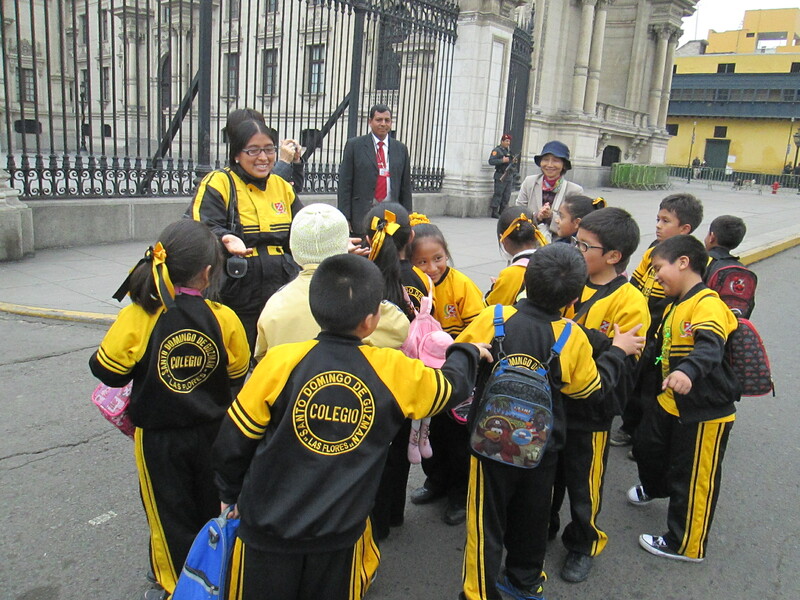 Seeing Peruvian schoolchildren, such as the ones above in front on Lima’s Palacio de Gobierno. (You can see the security personnel in the background.) Kids always make me feel good about the future, even if I don’t have any of my own. Being awestruck by the Volcano Sabancaya in eruption from Colca Canyon. Reliving my past by visiting the most ornate and gorgeous Catholic Churches I have ever seen. Experiencing heartfelt gratitude in Puno when I bought a handmade alpaca scarf from an old Aymara woman. Eating delicious wor won ton soup at a Peruvian Chinese restaurant, or chifa, on a cold day. Interacting with the Peruvian people in my broken Spanish, and finding it no bar to communicating with them. Feeling that the Inca moment in history is still going on, especially in the Sacred Valley. Because today is Thanksgiving, I will give thanks for Peru and for all the other wonderful places I have seen, all the kind people I have met, and that I still have it in me to want more. When I first arrived in Los Angeles between Christmas and New Year in 1966, the whole place looked brand spanking new. I had just arrived on the Santa Fe Railroad’s El Capitan at Union Station and saw a city very different from the grimy red brick and industrial pollution that was Cleveland. 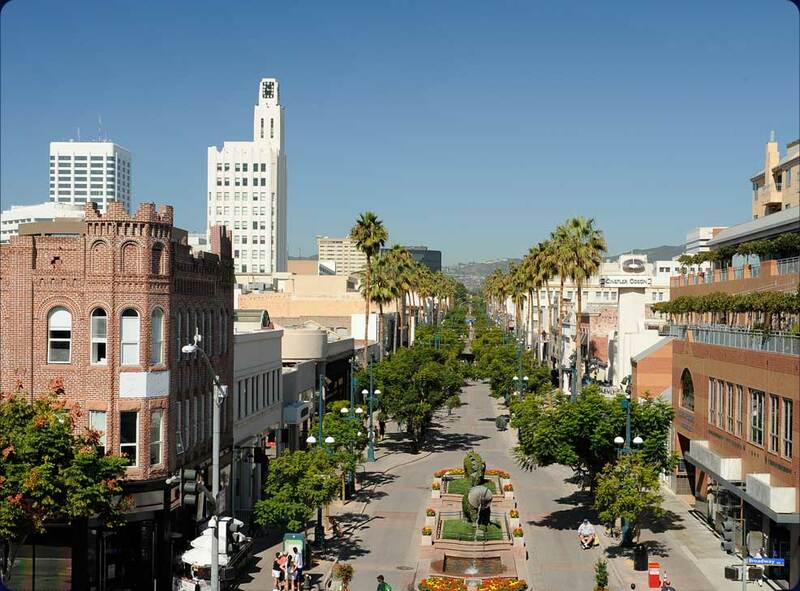 Within the first two days after my arrival, I took the Santa Monica #3 bus from San Vicente and Barrington down to the Santa Monica Mall, or, as it’s called today, the Promenade. I was impressed by the neatness and cleanliness of the place. There were movie theaters, restaurants, bookstores (yes, several), anchored by a J. C. Penney at the north end by Wilshire. It used to be fun to visit Santa Monica. The place made such an impression on my friends that most of them still think I live in Santa Monica, rather than West L. A. But now, I try to avoid Santa Monica, even though it begins a scant two blocks west of me. All the restaurants I loved are gone, replaced by places that are more pretentious and less tasty. The bookstores? Now there is only one, a Barnes & Noble at the Wilshire end. The movie theaters are sort of hanging on, but it looks as if the Criterion were history. The J. C. Penney store is long gone. What changed? There are two ways of looking at it. On one hand, the city has become a ghetto for the 1%, with only a few downmarket neighborhoods along Pico Boulevard that escaped gentrification. Also, I have changed. My taste in food is probably far different from that of the 21-year-old that ate at Castillo’s (the daughter of the owner was muy guapa), Las Casuelas, Marco Polo, Chowder Call, the Broken Drum (“You Can’t Beat It!”), the Little Inn Swedish Smorgasbord, El Tepa, the Great American Food & Beverage Company, and the El Sombrero on Fifth Street. Somewhere between Santa Monica becoming too hoity-toity for me, and my own self developing into another person, I found the place chilled me. Oh, I still use their excellent library—though I have to pay for the privilege now. But Martine and I almost never eat in Santa Monica any more. Today, for a change, we ate at the El Cholo on Eleventh and Wilshire. And we regretted it. Before I write another word, I want you to know that I am against this trend. I think there is an implied threat of legal action if one’s beloved oochie-woochie poochie is denied admittance anywhere. It’s a nasty trick to play on someone who is probably earning minimum wage and is afraid of repercussions if he or she is responsible for making a bad decision. Ms. Marx has been evaluated for and diagnosed with a mental health disorder as defined in the DSM-5. Her psychological condition affects daily life activities, ability to cope, and maintenance of psychological stability. It can also influence her physical status. Ms. Marx has a turtle that provides significant emotional support, and ameliorates the severity of symptoms that affect her daily ability to fulfill her responsibilities and goals. Without the companionship, support, and care-taking activities [?!] of her turtle, her mental health and daily living activities are compromised. In my opinion, it is a necessary component of treatment to foster improved psychological adjustment, support functional living activities [?! ], her well being, productivity in work and home responsibilities, and amelioration of the severity of psychological issues she experiences in some specific situations to have an Emotional Support Animal (ESA). 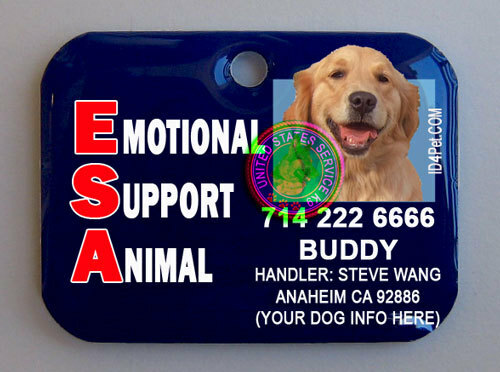 She has registered her pet with the Emotional Support Animal Registration of America [sounds real, don’t it?]. This letter further supports her pet as an ESA, which entitles her to the rights and benefits legitimized by the Fair Housing Act and the Rehabilitation Act of 1973. It allows exceptions to housing, and transportation services that otherwise would limit her from being able to be accompanied by her emotional support animal. You can buy cloth ESA badges from Amazon.Com. Does the buyer have to provide proof? Nope. Are you interested in getting into this scam for yourself? Just click here or here. You might have to fill out a questionnaire, mail a check, but you will not find yourself in front of a real psychiatrist diagnosing your actual mental health condition. This brings me to one of the more squirrely elements of our culture of fear. We know we must not discriminate against the disabled, whose rights are indeed protected by law, but mental health is a big gap in our healthcare system—one you can drive an eighteen-wheeler through. There exists in general a thriving industry aiding people who want to take advantage of the rights of the disabled without themselves being disabled. You can see the disability stickers on cars driven by perfectly healthy young people who just happen to prefer close-in parking spaces. Landlords will rent apartments to tenants with an ESA, regardless how phony, and even if there is a no pets policy. Martine and I are currently being victimized by one such dog who barks and whines for hours on end because her owner has decided to dispense with her “care-giving” services for an evening. If the trend gets even more out of hand, people will refuse service animals, which are in fact legitimate and certified. People’s pets can cause inconvenience to others, such as when an airline had to call in a hazmat team to clean up a particularly noisome pile of dog do left in the aisle of a flight. I Can’t Think of Any Advantages, Can You? The above picture of a standee of Mitt Romney after his 2012 electoral debacle pretty much sums up for me the joys and sorrows of being the President of the United States. I remember while growing up people asking me if I wanted to be President. While I was immensely flattered at the time, now I think the presidency is a booby prize, similar to being one of those carnival sideshow attractions in which people throw pies at your face or a ball that dunks you into a tank. This country is so evenly divided between the two political parties that you are guaranteed of being hated by millions of people, many of whom would like to see you impeached, assassinated, or at the very least publicly humiliated. The only U.S. President in recent times to have been liked by more than 50.1% of the population was Ronald Reagan, and then even he came in for a forest of brickbats toward the end of his second term when it appeared that his memory was fading. I was actually at the Reagan Presidential Library when Ronnie died. A newsman pushed a microphone into my face and asked me what I thought his legacy would be. I answered: “I didn’t care much for him as President, but he was a good communicator.” Of course, that never made it into any news program. I can see why Hillary Clinton may decide not to run in 2016: She would be roundly hated by millions. She saw that whole Kenneth Starr impeachment charade over her husband’s peccadilloes, not to mention that whole Whitewater fracas. And there were some who wanted to frame her for the “murder” of Vince Foster in 1993. Would I run for President? I would—but only if I could have right-wing pundits executed at will and senate and house members arrested for being too obstreperous. And what are the chances of that ever happening?